The E- Cell, IIM Calcutta in association with IIM Calcutta Innovation Park (IIM CIP) organised its flagship event – Ideas to Implementation (commonly known as i2i) 2018. The I2I business plan competition was a practical learning and implementation platform for aspiring entrepreneurs and proved to be a tough decision for the judges as they wracked their brains to decide on the winner out of 19 participating teams, all of which had come up with mind blowing business ideas that would yield great results if implemented. 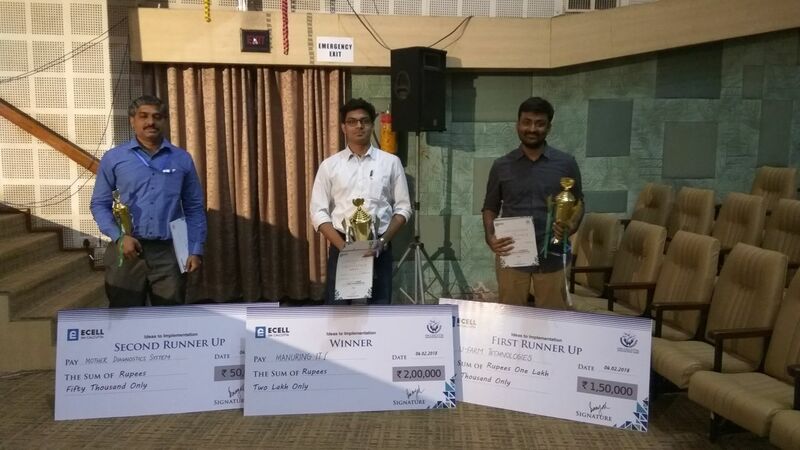 The judges for the competition were Mr Subhrangshu Sanyal (CEO IIMCIP) Mr.Sagar Daryani ( Founder Wow-Momo) Mr. Ambarish Murty ( Founder- Pepper Fry) and Mr. Aloke Mukherjee who finally came up with three names who would turn their Start-up dreams into reality based on Social Impact, Innovation, Business Model, Revenue Model & Sustainability, Leadership and Team. government’s projections and history of the crop value and demand. The information or the latching score will enable the farmer to know if he/she is under using or overusing the farm inputs. They have already started post revenue phase with equipment lending and insurance model. The digital platform will be patented and can host data of 1 million farmers in real time. Parallel to the competition, this year, the 11th International Entrepreneurship Summit which surpassed all its previous records in terms of magnitude, took place in IIM Calcutta Auditorium. The theme of the E- Summit theme was Think beyond Funding: Going Sustainable. Initiating the event, Mr. Subhragshu Sanyal, the CEO of IIMCIP threw some light on the issue of ‘Going Sustainable’ as it is a cause of global concern and point of discussion among many of the who’s who of the industry. He highlighted on the importance and heritage of this Summit and how it impacts the thought process of the attendees because of the excellence with which the course of events is carried out to be deciphered by the audience. The stalwarts who were present as speakers in the Summit to put forward their expert opinion around the subject of sustainability were Mr. Utkarsh Amitabh, Microsoft – Business Development; World Economic Forum Global Shaper (Davos50); Founder – Networkcapital.co. followed by Vinay Jaju , Founder , Onergy and Ambresh Murthy, founder of Pepperfry. Panel Discussion of IIMCIP incubated startup on Think Beyond Funding: Going Sustainable was graced by Varun Biyani, Anup Agarwal , Cofounder – Truckhal, Ekta Jaju, Founder-Onganic, Rajib Sengupta, Co-Founder -Arogya Medtech, Priyadarshini Dey , Director-NexConnect and proved to be fruitful from where attendees could draw inference of the subject. IIM Calcutta once again retained its reputation of fostering and motivating young minds and nurturing their talents irrespective of their background.